Mattel, Inc. kicks off worldwide celebrations to mark the 60th anniversary of Barbie, the number one fashion doll in the world designed to inspire the limitless potential in every girl. In its 60th year, the Barbie brand is honoring the largest lineup of global female role models and taking the next step to close the Dream Gap by donating to fund like-minded organizations aimed at leveling the playing field for girls through the Mattel Children’s Foundation. Research** has shown that starting at age five, girls start doubting their potential, this is the Dream Gap. CELEBRATING ROLE MODELS TO INSPIRE THE NEXT GENERATION by shining a light on women who are breaking boundaries in a variety of diverse career fields. Barbie will honor more than 20 women across multiple countries and continents ranging from 19 to 85 years old and speaking 13 languages. This is the largest and most diverse lineup of women honored to date by Barbie and a continuation of the “Shero” program launched in 2015. These women are gifted a one-of-a-kind doll made in their likeness, the highest honor from the Barbie brand. 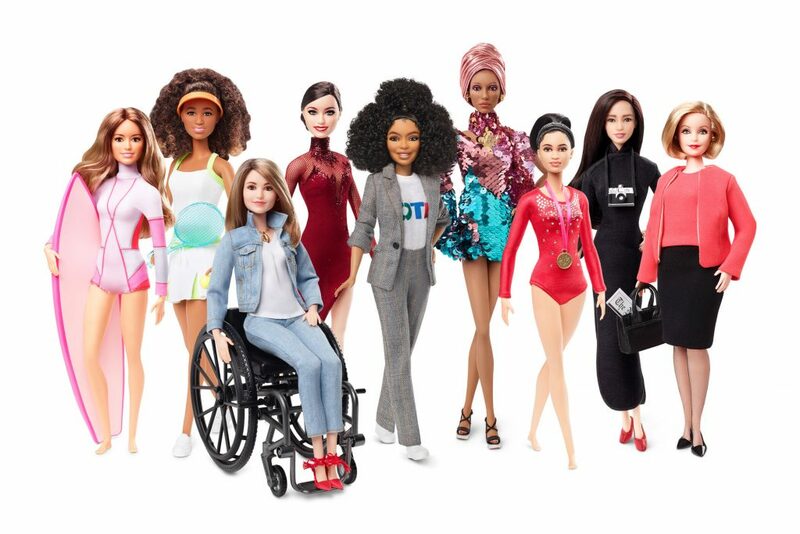 Around the world, Barbie is honoring role models including actress and activist, Yara Shahidi, tennis star, Naomi Osaka, activist and model, Adwoa Aboah, and many more. LAUNCHING THE BARBIE DREAM GAP PROJECT FUND by dedicating resources to like-minded organizations in support of closing the Dream Gap and leveling the playing field for girls. Barbie will donate one dollar from every doll sold* in the United States up to $250,000. The funds will be managed through the Mattel Children’s Foundation, the company’s social impact arm. Follow @barbie during the 60th celebrations and join the conversation to help close the Dream Gap and inspire a girl in your life by using #Barbie60 #YouCanBeAnything. LEVERAGING BARBIE AS A ROLE MODEL and connecting with fans through inspiring content that is purpose-driven at the core, while entertaining and fun. For the month of March, Barbie Vlogger becomes an editor on the YouTube Kids app with a curated playlist of inspiring videos. Barbie Vlogger was given this honor because she has become a top girl influencer on YouTube with more than 108 million views. HOSTING INSPIRING EVENTS FOR GIRLS AROUND THE WORLD and inviting fans everywhere to celebrate Barbie, a global cultural icon. To find an experience near you, please visit www.Barbie.com/60. An immersive Barbie pop-up experience in New York City to celebrate the brand’s past, present and future on March 9. Equal parts fashion tribute and art installation, fans of all ages can celebrate the icon. The Barbie “Be Anything” Tour will kick-off in Bentonville, Ark. with GRAMMY-nominated, country music star Kelsea Ballerini on March 9 and 10. It will run through October and stop at 36 participating U.S. Walmart locations. At each stop, girls can hear about a role model’s journey, enter for a chance to win up to $20,000 to make their dreams come true and enjoy other fun and interactive experiences for the whole family. “Barbie Presented by Amazon” pop-up stores are in five major markets across the U.S. based on Amazon’s innovative physical retail model. Fans are treated to an immersive Barbie experience through April 2. In-store activations in various participating U.S. Target locations throughout the country on March 9 that will feature the “What Will You Be” exclusive Barbie-themed apparel and accessories line for girls ages 5 to 10. Celebrating female empowerment with a visual message at landmarks across the world including New York’s Empire State Building, TOKYO SKYTREE®, Toronto’s CN Tower and Sydney’s Bondi Beach. INTRODUCING COMMEMORATIVE PRODUCT encouraging girls to dream. From princess to president, astronaut to zoologist, there isn’t a plastic ceiling Barbie has not broken. Barbie Career 60th Anniversary doll collection celebrates six careers that have been in the Barbie line from the beginning and are still areas that are underrepresented by women, including astronaut, pilot, athlete, journalist, politician and firefighter. Barbie 60th Anniversary and Proudly Pink Barbie dolls pay homage to Barbie’s heritage with stunning design to celebrate 60 years of fashion. *For every Barbie doll purchased in the U.S. between 3/6/19 and 3/11/19, Mattel will donate $1.00 to the Barbie Dream Gap Project Fund (part of the Mattel Children’s Foundation) – up to a maximum total donation of $250,000. Offer is void in AL, AR, CT, HI, IL, MA, MS, NH, NJ, NY, SC and UT. No portion of the purchase is tax deductible. **Study conducted by researchers at New York University, the University of Illinois and Princeton University.